Metrics are the lifeblood of the modern email marketing program. Marketers recognize the importance of measuring every aspect of their email program, to prove their effectiveness and demonstrate their impact on the bottom line. But which metrics are the most important? What if metrics could tell you more than just how many emails are being opened, how many links are being clicked, and how many sales result from those clicks? What if you could get insights like these? Many marketers will look at this list as pure fantasy, but the truth is we’ve entered an age of data enlightenment. Metrics like these are not only available, they’re critical to gaining true insight into the health and success of your email marketing program. Metrics are often divided into chronological categories, according to where they occur along the buyer’s journey. We prefer to classify metrics differently, based on what they actually tell you about your email program. Accordingly, we’ve divided 16 of the important metrics into three categories: Awareness, Clarity,and Connection. We discuss the most basic category of metrics in terms of “Awareness,” because they offer high-level visibility into the health of your email program. 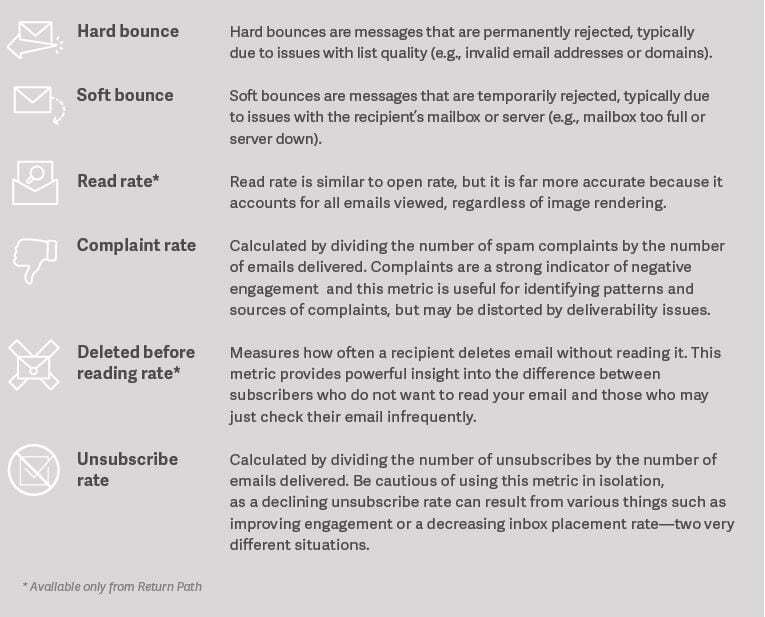 These metrics provide simple insights into what’s happening within your email program—and may tip you off to potential problems—but they don’t go deep enough to provide any truly actionable insights. Taking things a step further, we have “Clarity” metrics. These measures take the analysis of your email program to a deeper level and provide more sophisticated insights into deliverability and engagement. Some provide a more granular view of “Awareness” metrics, while others can help you uncover the “why” behind email performance issues. 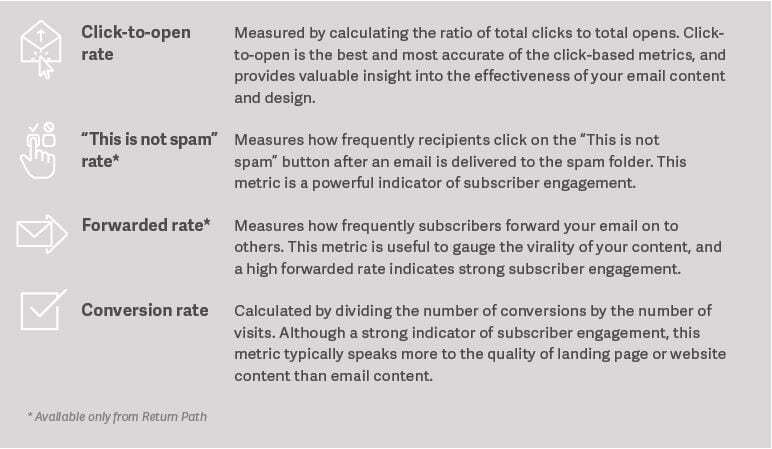 The most sophisticated—and often most valuable—category of metrics relates to “Connection.” These metrics provide the truest measure of whether subscribers are engaged with your brand, as well as the depth of their engagement. Properly interpreted, Connection metrics can help you evaluate specific aspects of your email program, like the effectiveness of your content and design. Check back soon for a follow-up post, where we’ll show you how to use these metrics to troubleshoot common problems in your email program. Looking for more insight into email marketing metrics? 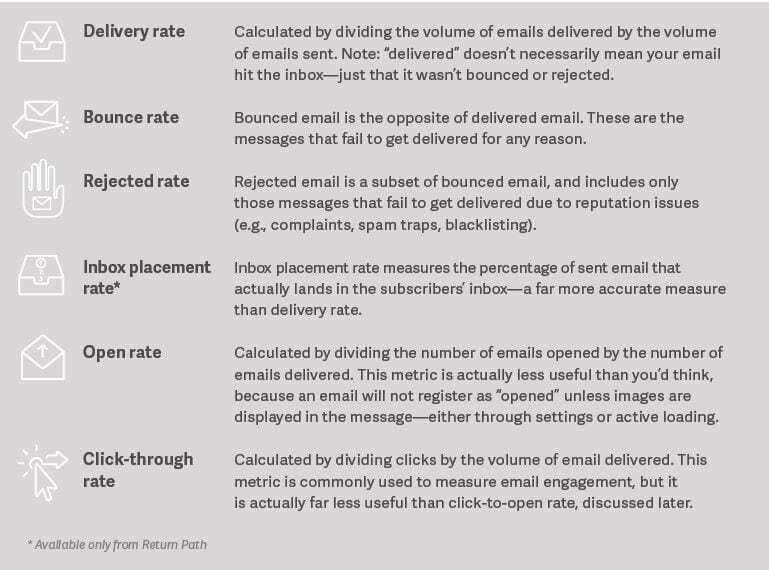 Download the Guide to Email Marketing Metrics. With more than 15 years of marketing and PR experience, Jen Ribble is passionate about the art of storytelling and the science of creating high quality, data-driven content. 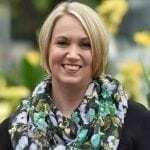 In her current role as Director of Public Relations for Return Path, Jen is responsible for elevating the company’s reputation in the marketplace, crafting engaging thought leadership content, enhancing customer relationships, and driving inbound leads. In her spare time, Jen is an aspiring chef and food lover, a movie fan, and a travel junkie.